William Crozier, 1930-2011. Fallen Figure, 1962 152 x 152 cm, 59 7/8 x 59 7/8 in. 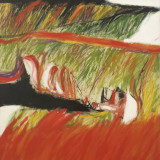 The Irish Museum of Modern Art (IMMA), Dublin, together with the West Cork Arts Centre, Skibbereen, and Piano Nobile, Kings Place are to present a major retrospective dedicated to Scottish-born, Irish artist William Crozier (b. Glasgow 1930, d. Cork 2011), from 15 July 2017 to January 2018. Featuring works on loan from Piano Nobile, this exhibition will present his familiar West Cork landscapes from the 1980s against a backdrop of his early work inspired by the Existentialist movement and the anxieties of the post-war period. The exhibition will be shown sequentially across the two venues with Crozier's later works from 1985 showing at West Cork Arts Centre (15 July – 27 August 2017) and his earlier works shown at IMMA (13 October – 2018). Both exhibitions are curated by Sean Kissane (Curator, Exhibitions, IMMA). Crozier began to exhibit in the early 1950s and his bleak views of the British landscape from that time are imbued with a darkness and pessimism that is immediately apparent. Crozier’s time spent in Paris in the 1940s, and his encounter with the Existential writings of Jean-Paul Sartre gave a voice to this post-war malaise, and became a touchstone for the work he would make over the next fifty years. For more information, please visit the West Cork Arts Centre and IMMA websites.